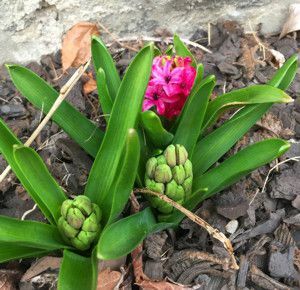 Since we have had unseasonably warm weather in February, we are beginning to see spring bulbs, such as crocus, hyacinths, and daffodils emerge from our gardens. It won’t be long before we see tulips as well. Cover plants with an old bed sheet, burlap, newspaper or some other fabric to keep them insulated from frost, cold air, and wind through the night. If preferred, an empty plastic pot or cardboard box will work just as well. (If using a bed sheet or newspaper, be sure to pin the edges down with a rock or some bricks. Also, be sure to place the cover before night fall. Remove the frost cover the next morning after the frost has lifted from your grass blades. This will allow the plant to breathe and recoup during the day time. Repeat as necessary to protect your plants from frost on consecutive nights.